Brand new goodies at Bayberry Cove! 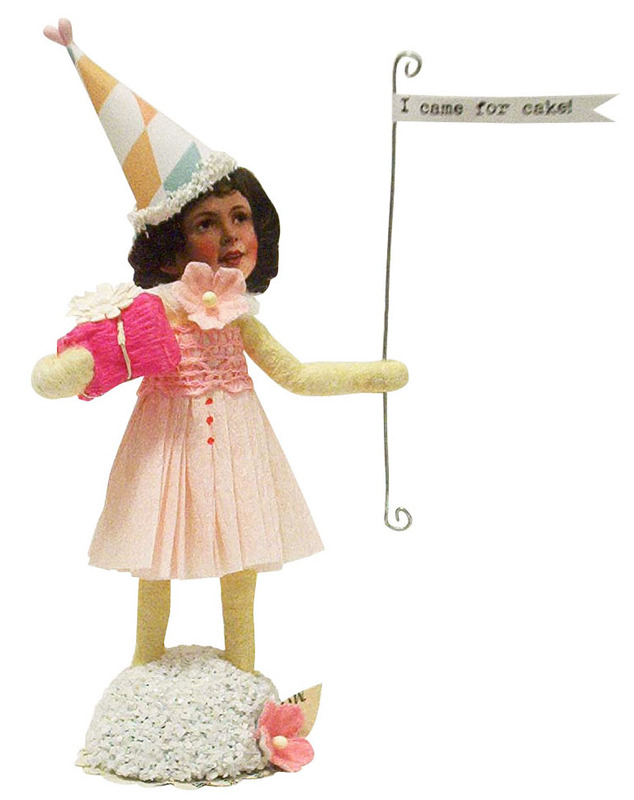 I just sent some fabulous new characters off to find new homes at Bayberry Cove. They are special editions made exclusively for Bayberry Cove and I'm so excited about them! 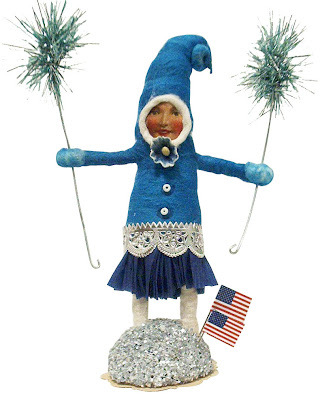 The Blue Sparkler Elf is my favorite from this batch I think...she's so jolly! And spring has come early this year in New England, so it seems that summer will too! And I'm definitely planning on some patriotic decorating...I'm getting that ecstatic feeling just thinking about it! ...American flags, banners, fire crackers, fire works, outdoor family picnics complete with cakes topped with strawberries, blueberries and whipped cream (red, white and blue). So fun! 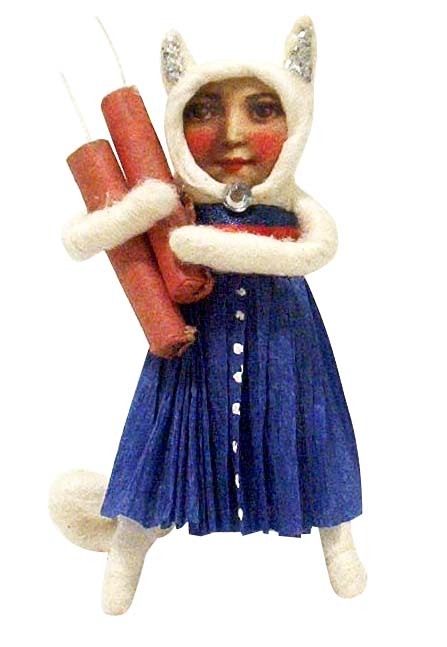 The Fire Cracker Cat Girl is ready to celebrate in a big way! This Flapper Girl is really sweet and demure and she's wearing my favorite kind of hat. This one is really sweet and says "I Love You". And this Birthday Girl knows what she wants! But back to the birdie. It seemed like it was meant to be! A few days after the pet fiasco, I was walking to the post office and right on the side of the building on the sidewalk, I noticed something near my foot, looking up at me. It was this sweet little parakeet! It was a frigid and rainy day, and the poor thing was shaking (he is a tropical bird after all!). He was only about a foot away from me and I figured he might be used to being touched since he was so close and didn't try to fly or run. But I was wrong and he flew into a nearby driveway. After some back and forth and a bit of chasing, I finally caught him in someone's backyard by using my hat. I brought him home and after a few days of quarantine to make sure he wasn't sick, I introduced him to our other parakeets, Sam and Michelle. They get along swimmingly! Yay! The new guy is still too afraid to leave the cage, but in time he'll come around. I leave the cage door open all the time so they can fly freely, but they choose to spend 99.9% of their time either in their cage, or on a milkglass pedestal dish in front a mirror in my dining room cubby. This sweet boy must have flown out a window or door and was probably lost for at least a day. I checked the message boards online, but no one was looking for a missing bird. So he is now a welcomed addition to our family! Most of these goodies are one of a kind. My favorite! I can see these gals attending a whimsical birthday party this summer! I'm loving the bugs and butterflies...I hope you do too! PS - Sharon makes beautiful custom embroidered bags, etc. and you can gift a special person (or yourself) with her amazing work...visit her Etsy shop for more info! ...with a celluloid kewpie inside! I found it an antique shop in Ballston Spa NY while I waited for my sister at the dentist. A good distraction! And I don't have a lot of price books or antique guides, but I happened to find this box in two different books I had! Weird. The photo above is from a Japanese book called Yesterday's Toys. It's not a price guide, but has the most fantastic celluloid and tin toys in it...it's positively drool worthy! The little black baby in the watermelon is a bit ill fitting in today's society, but I still think it's super cute and would grab it up if I found it! There was a yard sale right outside the train station where I picked up Ben one day. It yielded some great things! Including a nice old side table and round-top shelf that I put into storage before I snapped a photo. This flour sifter is a bit grimy, but will serve as a pretty storage bucket! Some tidbits from that sale and the local ghetto flea market. The rose lidded jar is my favorite. I'm not in love with this paint by number, but for a buck it will look nice with the doggie paintings I have and any future pieces I find. And these hats were found at the same antique store while waiting for my sister. They were a pretty good price and if I'm desperate, will also serve as a good source for vintage flowers! When we were in Miami last month, we did about two hours of antiquing with Ben's grandma. There was a strip of road that had antique store after antique store. I was quite excited, but after the first overpriced store, I didn't really expect to find much. Most of the stores were jam packed with goodies, but it was all too expensive. While I was in one store, the knee slapping owner was a hoot, but was also quoting crazy price after crazy price. I didn't plan to spend much time in there, but I ventured in deeper anyway. I found a small pile of Christmas ornaments. I hesitantly asked how much a zip lock bag with about 6 tiny regular, but old ornaments were. "Twenty bucks for that" he said. Yikes! Even five dollars was pushing it. I put it back and continued looking. Then I spotted a shallow box balancing on top of a narrow display case and carefully lifted it down. It contained a bunch of really nice vintage glass Christmas corsages, along with a few floral picks and some random junk. 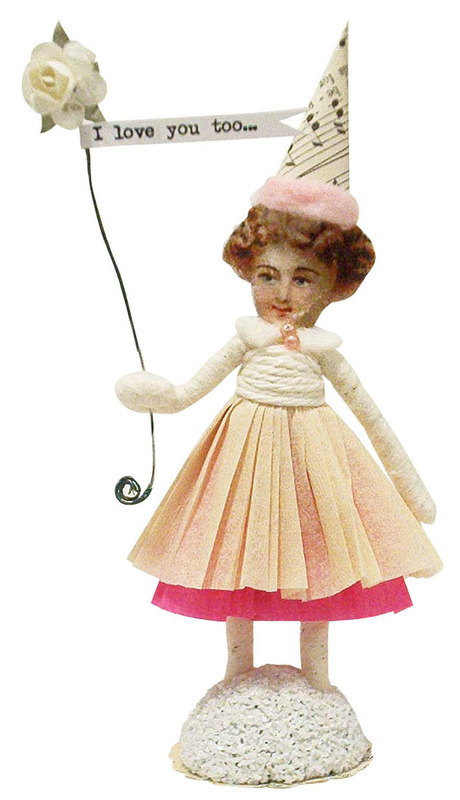 I was shocked to also see a pair of antique paper ornaments! I thought they were spun cotton at first (they did have cotton watte heads), but then I realized that they were made out of crepe paper. Layer after layer of crepe paper. Jackpot! I'd never seen any like that in person! I knew they were worth a lot and was afraid to ask, but I did anyway. "Let's see...I'll need to get ten bucks a piece on those." Gasp! What? He wanted over $400 for a run of the mill paper mache jack-o-lantern in not so good condition...but only wanted ten bucks for these beautiful rare ornaments in near perfect condition?! Well...I wasn't about to argue, so I calmly said "Hmmm...ok. How much for this other stuff?" He gave me an ok price on the other stuff and I just accepted it all and gave him the money before he could change his mind. Score!! Finding these rare crepe paper and cotton snowman and clown really made the whole trip! I didn't care if it rained or if Ben got grumpy (which he didn't) or anything else. I was taking those rare specimens home and that was all that mattered! On any other day, these beautiful corsages would have been the find of the day...but they only come in second now. They really are amazing with the tiny beads, the little beaded elf and the glittered reindeer with no missing legs or antlers. I think I'm just going to hang them on the Christmas tree! These floral picks are really special (I love that beaded guy and the pink tinsel icicles) and will probably show up in my spun cotton Christmas pieces this year. You can never go wrong with anything vintage and honeycombed! Especially in bird form! It will look great on the tree! And this little sock is just waiting for some spun cotton creature to snuggle up in it. I also found some pretty hardware at another store. The eagle will be great for my July 4th figures and those knobs will end up on some piece of vintage furniture down the road. This piece was my only purchase from one store that was absolutely chock full of things. It seemed silly bringing this tiny thing up to the counter with it's $1 price tag. 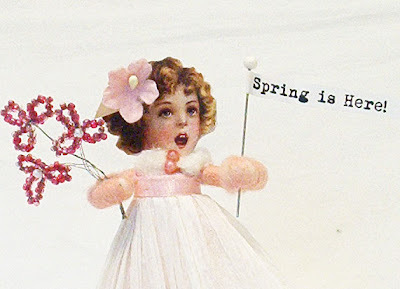 But it's perfect for Easter projects and will look great once transformed! Thanks for joining me on this trip down antiquing memory lane! I can't wait 'til next time! My Easter decor is still out...maybe this weekend I'll put it away, leaving out a few bunnies and chicks just because it's still Springtime after all! 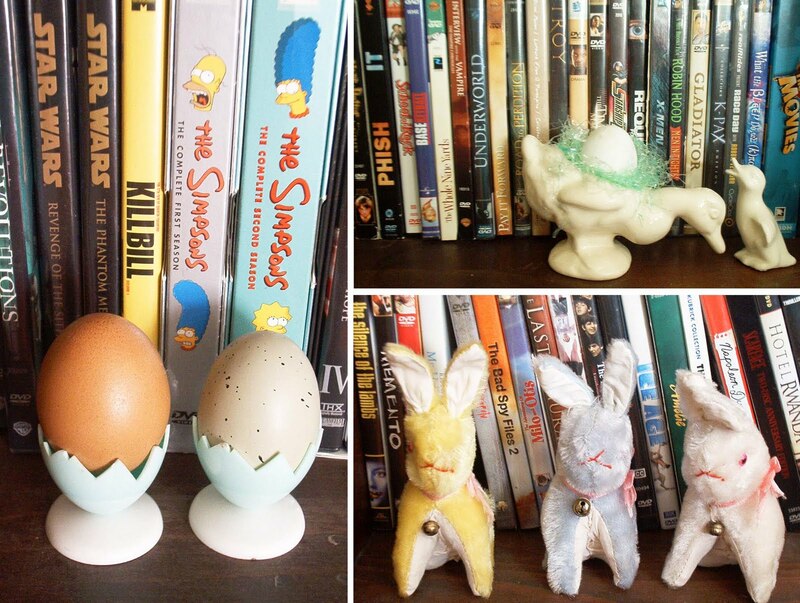 But because I'm still in an Easter-y mood, wanted to show you a couple of fun photos from collectors. The photo above is from the sweetest gal who so tenderly displays her spun cotton V by C characters all around the house. 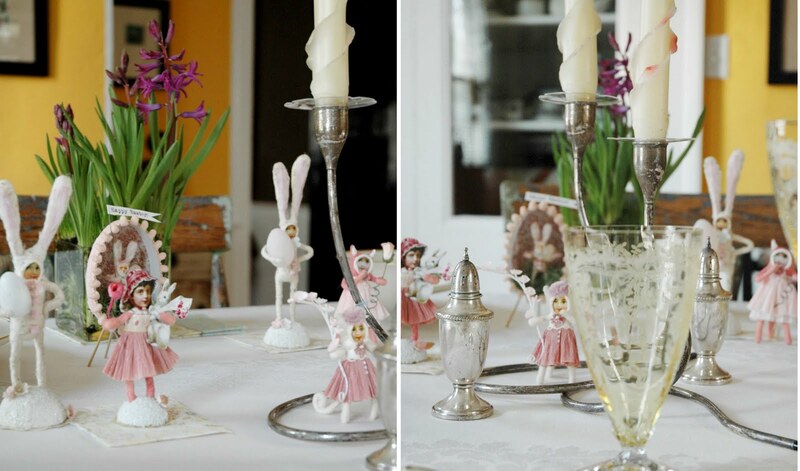 She had a subtle pink theme on her Easter table and it looked so magical! This photo was sent to me by Lisa from Aqua Marine Queen. 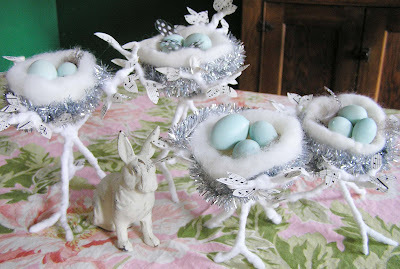 She made this quartet of nests from my directions on Martha's website and did a fabulous job! And Heather from the Speckled Egg had a great swap last month that I participated in. It was Easter nut cup themed and I got this wonderfully whimsical creation from Lorraine of Paper Bird. She also sent a little envelope of extra goodies...including a tiny baby chick charm which will be added to my charm bracelet. Thank you so much Lorraine!! Ok...I suppose I should move on to other non-Easter related things. So in the next few days I'll be showing you a slew of some of my recent treasure hunting finds. Yay! I hope you all had a very happy Easter! I had a very low key celebration with my family in upstate NY (Ben stayed in Boston - he had to work). It was beautiful so we ate outside near the pond and my sisters and I spent all afternoon on the trampoline. Then my dad and I spent the evening hashing out preliminary wedding plans. It was great! Now it's time for little bit of bragging on my part. It's not always proper to brag, but I can't help myself today. A friend of mine sent me this link to Martha's blog and I was so flattered to see that she had a bunch of my silly creations on her dinner table for her meeting with Hallmark and for Easter! Her home is (of course) so beautiful and is all soft grays and white. My nests fit right in with the rest of her centerpieces...but my bunnies were giggling at the thought of them being invited to dinner too! His bright blue color sticks out like a sore thumb among the white and clear dishware. His pink buddy blends in a little better. Of course the center pieces aren't the focus of this photo...however I couldn't help but play Where's Waldo! Can you find the pink bunny, blue bunny and two nests? I think this is Martha's Easter table...all ready set for the big Sunday feast! These two pictures are also from Martha's blog. I just love how these eggs look displayed in this old funeral/wedding basket. I've got a bunch of those baskets in storage and this makes me want to pull them out for next year!! And I can't decide who is cuter...the little cotton chicks or the kitty. Those roosters look so amazing in a little chickie army! These guys typically hang out with their teddy bear and stuffed doggy friends, but for now they form a sweet trio in a pretty vintage basket. My favorite area to decorate is the dining room nook. It's very large and my milkglass collection always serves as a great background for additional seasonal goodies. It's so easy to dress it up! Bunnies and chickens and ducks are perfect for spring! I found the rooster egg cup in Germany and later on found his pretty hen wife at a garage sale somewhere here or there. They're quite happy to have found eachother. The top of my China hutch is another favorite place to decorate. I have my wedding goodies there...but I also added a few Easter things to them too. Why not? The living room side table can't be ignored! My Dad gave me a dozen fresh araucana eggs the last time I went to visit and I mixed them with a few white eggs from our fridge in a large apothecary jar for a colorful but subtle display. I'll keep them out all year long. Eventually the eggs will dry out and will last forever (assuming they stay away from a clumsy Ben). 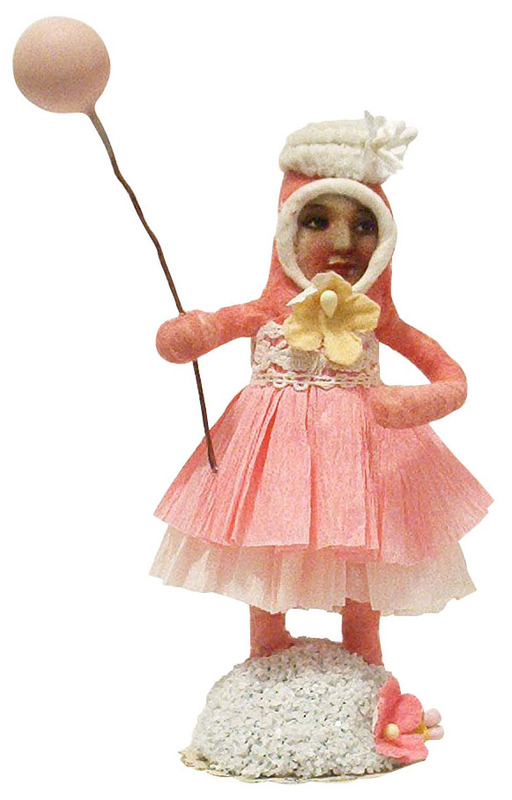 That milk glass rabbit was a great find a few years ago...so glad I snatched it up! This little guy was a recent splurge at Tinsel Trading. He's not old, but he sure looks it and he opens up to stash candy! The springy ears are what really got me! Of course I couldn't neglect the dvd shelf. 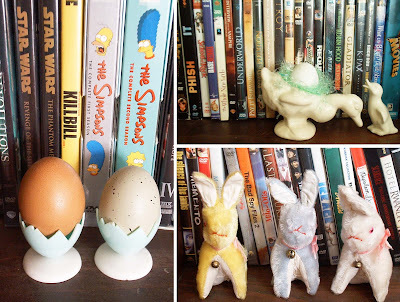 A few scattered bunnies, eggs and ducks are perfect to detract from the multicolored-ness of random dvd jackets. Hope you liked my little tour! I'm heading to my parent's house tomorrow morning for an Easter BBQ and decorating eggs...I hope you all have a great Easter holiday!